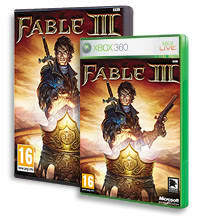 In this third edition of the majestic Fable franchise, you will witness tyranny, poverty and injustice plague your land. You will see a people divided, and you will be compelled to stand up for change. You will also be forced to answer a question in Fable III: What would you sacrifice to secure the crown of Albion? Will you uphold the values and principles that led to your ascension, or will you be corrupted by the station you've strived to acquire? Will you be a monarch of the people, or bring the entirety of Albion to the brink of collapse? Fable III for Xbox 360 is the follow-up to the magnificent, award-winning Fable II, and promises to offer one of the most enchanting, approachable and - with a voice cast of true acting greats - at times downright funny adventures of the entire gaming year.